Surfer's ear is the common name for excessive bone growth within the ear canal. Cold wind and water exposure causes the bone surrounding the ear canal to develop broad masses of new bone called exostoses, which narrow the ear canal. 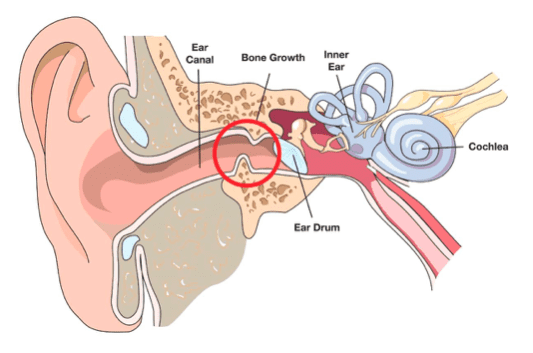 Surfers (and swimmers or divers) are often exposed to cold water and wind, resulting in excessive bone growth and subsequent narrowing (stenosis) of the ear canal. This results in water trapping, clogged ears, hearing loss, recurrent infection, and pain. Coastal Ear, Nose and Throat can provide relief of symptoms from surfer’s ear through a minimally-invasive procedure, performed within the comfort of our own surgery center. Dr. McAfee, our fellowship trained neurologist, is the only surgeon in the tri-state area that uses a minimally invasive procedure to remove bony exostoses. With the use of surgical osteotomes, bone growths are removed through the ear canal without the need for an incision behind the ear. Questions? Call Coastal Ear, Nose and Throat today at 732-280-7855.